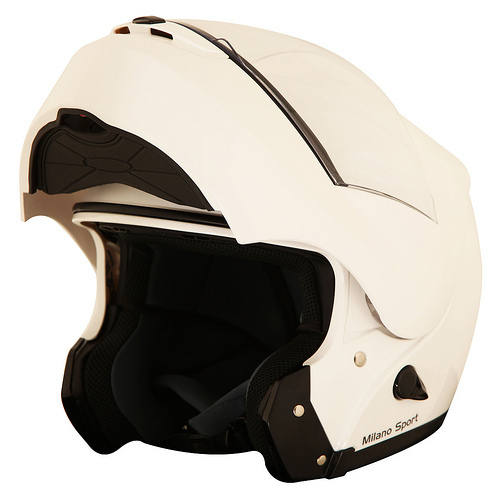 The Milano Sport 3000A is manufactured to ECE 22.05 (the current Europe-wide standard for motorcyclists protective headgear) using ABS, a type of thermo-plastic noted for its impact resistance and toughness. Affordable, well made quality products are the key to the fantastic new Milano Sport Motorcycle Clothing collection. Perfect for first time buyers or for those who just want to save a little money, Milano Sport is the ideal brand for all riders on a tight budget. The 3000A flip-front model features an internal sun visor. Its main visor has a quick-release mechanism and the entire chin guard may be removed to convert the 3000A into a jet style helmet. For quality, comfort and practicality the Milano Sport 3000A Flip Front Motorcycle Helmet is one of the best budget flip-up lids on the market. With this helmet you can have the best of worlds, a practical helmet for when you are just popping to the shop and a comfortable reliable helmet for those long journies. Quick release buckle. Super, stylish budget flip-up helmet with integral sun visor (with useful quick-release mechanism), the rubber chin guard keeps the chill off and three external air vents to keep your head cool make this helmet an excellent versatile lid for those on a restricted budget. Available in gloss black and white. Sizes – XS-XL.